Air traffic controllers are now able to analyse the environmental efficiency of flights in near real-time, thanks to a new tool developed by NATS. The Flight Optimisation System, or ‘FLOSYS’, takes real radar data, updated every three minutes, and combines it with NATS’ 3Di airspace efficiency metric to produce a graphical representation of every flight in UK airspace. Controllers can then analyse the efficiency of an individual aircraft through every phase of flight and airspace sector, as well as compare it against other flights along the same route up to 12 months ago, including the average and best performing. By having access to this granularity of data for the first time, controllers and airspace managers will be able to better identify the opportunities for operational improvements that will save airlines fuel and cut carbon emissions. Since 2012 NATS has measured the efficiency of an aircraft’s route and trajectory using its three dimensional inefficiency (3Di) metric where each flight is compared to a scale where zero represents total environmental efficiency. Most flights typically score somewhere between 15 and 35. 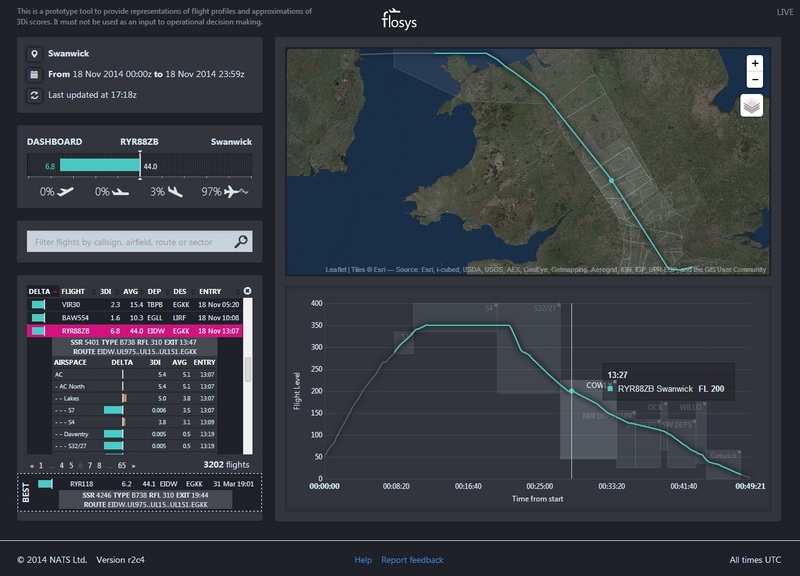 However, it is only with the advent of ‘FLOSYS’ that controllers can now immediately see 3Di scores for individual flights and identify specific areas for improvement, or best practice techniques to share. The system has been developed by the NATS innovation centre, SPACE, together with Altran UK and Lockheed Martin, and with input from the operational ATC community at both NATS’ Swanwick and Prestwick centres. The initial roll out is at Swanwick, before moving to Prestwick Centre next year. The project forms part of NATS’ wider environmental programme, with its interim target to cut air traffic related CO2 by an average of 4% per flight by the end of this year, along the way to achieving a 10% saving by 2020. Ian Jopson, NATS Head of Environment and Community Affairs, said: “All the indicators point to us achieving our 4% target for the end of this year. That’s a fantastic achievement itself, but it is just a milestone on our way towards meeting our 10% goal.